A collection of tender love poems, The Seasons offers readers a glimpse into the many moments of beauty and promise between a lover and his beloved. If haiku in Japanese literature is a word picture that seizes a moment, the sonnet in the English tradition is a sound picture that makes time stand still. The Seasons is a book of whispers spoken by a voice to his beloved. Inspired by the original meaning of the word ‘sonnet’ (‘a little sound’), Bruce Meyer transforms the poetic framework to record the intimate moments in the lives of two people. The accumulation of those moments is what comprises the lives of those two people, and the reader is invited to eavesdrop on the utterances and promises of their lives. Written over a ten-year period and finally collected here, The Seasons takes up the process of a century of sonnets where each, as in the tradition of Neruda’s 100 Sonnets, is a little whisper in the ear of the lover. The Seasons, with careful descriptions of natural details, ably reminds us that enchantment can be found in ordinary hours. 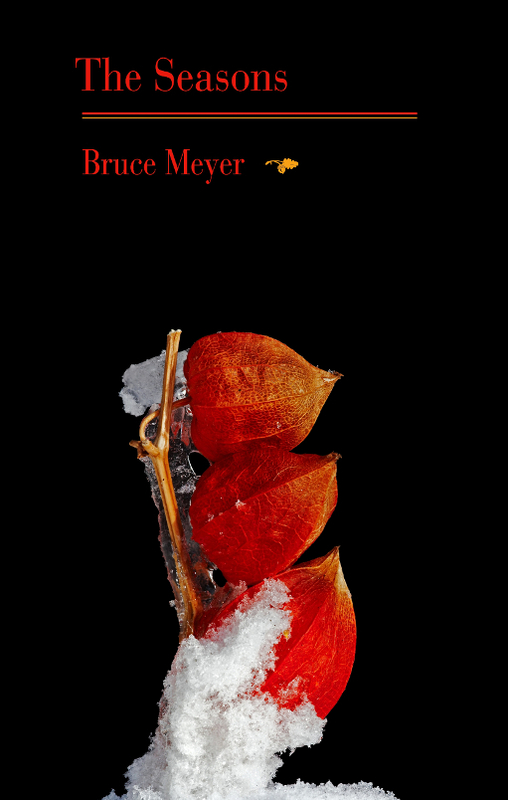 Bruce Meyer, poet laureate of the city of Barrie, Ontario, gathers one hundred sonnets for his wife in his latest collection. The Seasons charts the course of a marriage with delicate reverence, drawing from Canadian landscapes, musings on time, the spiritual, literature, domestic moments, and the beloved. Meyer’s praise of the commonplace, "the house an ark containing the world," evokes the hushed miracle of a lasting relationship. The book uses seasons to frame memories, beginning with winter. Here, the speaker encounters "seraphim breaths," quiet days, and a lover’s "breath / forming spheres where spirits danced." In one instance, snow becomes "a blanket wrapping us in our love." In another, snow is "bright enough before its melting" to fill the scene with "angelic splendour." Meyer’s romantic, airy language is brimming with sentiment, yet fits the snowbound mood. Tender gestures are tempered with hints at mortality that deepen the work. The impression of a swirling, fleeting world is perhaps most crystallized in the lines "I long to be a shadow in the crowd / that brushes gently against your shadow." If the poems recount familiar material—including the joy in gazing at a lover, allusions to Eurydice and Orpheus, expressions of longing, and the idea of time being precious—they also display a careful eye for natural details. At times, comparisons stretch too far; in lines such as "Passion is a stray ember that rose / from the burning shore across the lake / and attached itself to the loveless dark / that cowered over itself and sank itself, / reflectionless, in the still water below," the initial image is lost. More successful poems take a firmer, less elaborate path toward unexpected realizations. Standouts include "Holly," which features lovers walking through snow, and ends with an abrupt, bold turn that connects a personal moment to the wider world: "the blood of uncertain history is on our hands." Another effective poem, "Building Blocks," presents a series of aphoristic lines that reveal simple, thought-provoking views. Not all of the sonnets transcend. Read as fragments in the story of a partnership, however, they reveal whimsies alongside sober reflections. The speaker’s message that "to be is to live and to live is to love" is not uttered in naiveté but stems from a lifetime spent in gratitude. The Seasons ably reminds us that enchantment can be found in ordinary hours and that mutual dedication creates its own reward. to celebrate the vibrant death of nature. and attempt to make beauty a souvenir. But the colour always dies in its own brilliance. overlooked as it flowed through our sleep. The cold rock I rest against is foreboding. It knows its cooled igneous will triumph. draws life from you the way a bee drinks nectar. yellow, red, soft gold, and sunset orange. covering the place where even shadows fade. They keep their secrets. They mask our trails. that rise and try to touch the sky with need. fingers curling around the dwindling light. So many words seem to have died in silence. So many brightly coloured hopes lie scattered. Watch where you walk. There is life in them still. Bruce Meyer has spent most of his life in an on-going conversation with Canadian literature and Canadian letters. Known across Canada for his broadcasts on the CBC with Michael Enright on The Great Books, A Novel Idea, and Great Poetry: Poetry is Life and Vice Versa, Meyer is author of 49 books of poetry, short fiction, non-fiction, literary journalism and pedagogy. With Brian O’Riordan he produced two books interviews with Canadian authors: In Their Words (1985) and Lives and Works (1991). As a poet, he won the E.J. Pratt Gold Medal twice, the Gwendolyn MacEwen Prize for Poetry, and the IP Prize in the United States, and was runner-up for the Indie Fab Award, and the Cogswell Prize. Among his poetry books are To Linares (2016), The Seasons (from Porcupine’s Quill, 2014), The Madness of Planets (2015), The Arrow of Time (2015), Testing the Elements (2014), The Obsession Book of Timbuktu (2013), A Book of Bread (2012), Mesopotamia (2010), Dog Days (2010) and with H. Masud Taj Alphabestiary (2012). 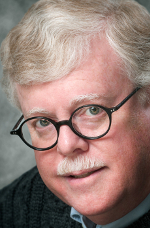 His 2000 book on the Great Books, The Golden Thread, was a national bestseller, and was followed by Heroes (2007). With Barry Callaghan he was co-editor of the landmark anthology, We Wasn’t Pals: Canadian Poetry and Prose of the First World War (2000, 2014), and with Carolyn Meyer was co-editor of the groundbreaking anthology The White Collar Book (2011). Meyer is professor of Creative Writing and Communications at Georgian College in Barrie, and an Associate at Victoria College in the University of Toronto where he teaches in the prestigious Vic One Program. He was the inaugural Poet Laureate of the City of Barrie, and lives there with his wife, Kerry and daughter Katie.